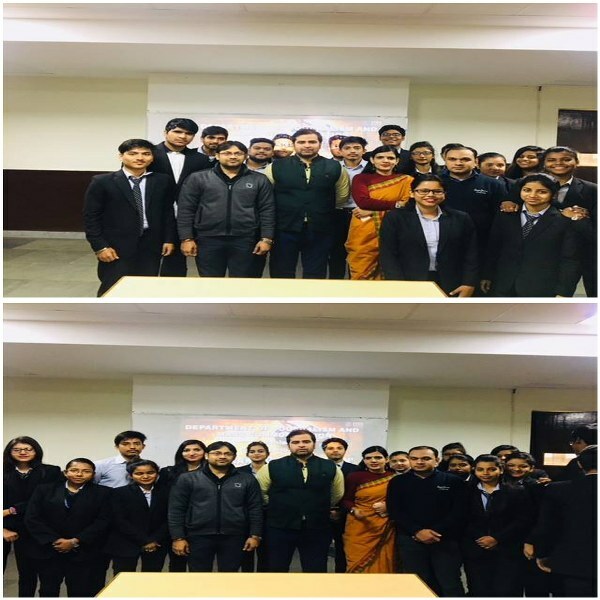 Guest Lecture on "Film Making and Direction"
IMS Ghaziabad - University Courses Campus organized a Guest Lecture on "Film Making and Direction" on January 31, 2019. The objective of the guest lecture was to teach students of Journalism and Mass Communication Department, how to make an approach and steps to follow while making or directing a film. The guest of the day was Mr. Deepak Sharma from Film and Television Institute of India Pune. The session included discussion on movie genres, film analysis and social impact of films. Through this short film "Juice", the guest gave an insight on how to scrutinize and study every shot and dialogue to understand the underlying concepts of a film. Being a Director of the film selected for International awards, Mr. Sharma shared firsthand knowledge with the audience and his own personal experiences while in field. He emphasized on the point that treatment and Director's perspective is extremely important to make a quality film. Films must break stereotypes of the society in general.